Having completed an emphatic victory against hosts Australia on day 5 of the third Domain Test match, India were welcomed back at the hotel by an enthusiastic entourage of the Bharat Army. 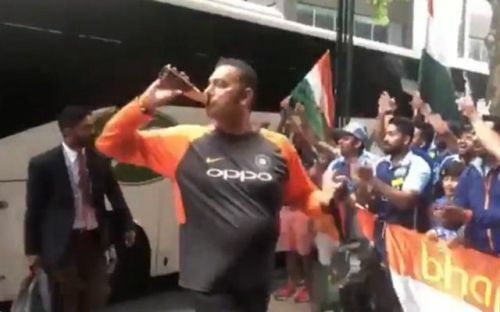 Coach Shastri was the first one to get down the team bus and did so in some fashion too. After getting down the bus, he had a quick gulp in front of the fans before exiting the scene into the hotel. Always coming across as a bull-headed person, Shastri, once again, showed the world he doesn't care about the naysayers. Bharat Army fans were merrily dancing away at the sight of their star cricketers. Acknowledging their unwavering support, skipper Virat Kohli too made few dance moves en route to the hotel. All-rounder Hardik Pandya and bowling coach Bharat Arun too grooved to the music while passing by. Having won the third Test match, India has successfully retained the Border-Gavaskar trophy, having won it the last time around it was staged in India. With the overseas tours of England and South Africa ending in disappointment earlier in the year, this Test victory comes as a big boost for Indian cricket. Now possessing an unassailable lead, they will go into the final Test match brimming with confidence. India is blessed to have an excellent fan base anywhere they tourn in the world. Especially on tours of England and Australia, the fans' warmth makes the cricketers feel at home. They along with England's Barmy Army are one of the most passionate groups of cricket fans around the globe. The final Test will be played at the Sydney Cricket Ground. Middle-order batsman Rohit Sharma will miss the Test owing to the birth of his baby girl with wife Ritika Sajdah. The match is scheduled to begin on the 3rd January 2019.